A nail consists of a metal rod or shank, pointed at one end and usually having a formed head at the other, that can be hammered into pieces of wood or other materials to fasten them together. A nail is usually made of steel, although it can be made of aluminum, brass, or many other metals. The surface can be coated or plated to improve its corrosion resistance, gripping strength, or decorative appearance. The head, shank, and point may have several shapes based on the intended function of the nail. Of the nearly 300 types of nails made in the United States today, most are used in residential housing construction. The average wood frame house uses between 20,000 and 30,000 nails of various types and sizes. Nails are divided into three broad categories based on their length. In general nails under 1 inch (2.5 cm) in length are called tacks or brads. Nails 1-4 inches (2.5-10.2 cm) in length are called nails, while those over 4 inches (10.2 cm) are some-times called spikes. These categories are roughly defined, and there is considerable crossover between them. The length of a nail is measured in a unit called the penny. This term comes from the use of nails in England in the late 1700s when it referred to the price of one hundred nails of that size. For example, a "ten penny nail" would have cost ten pennies per hundred. The symbol for penny is "d," as in 10d. This designation is believed to go back to the time of the Roman Empire when a similar form of measurement for hand-forged nails involved a common Roman coin known as the denarius. Today the term penny only defines the length of a nail and has nothing to do with the price. The shortest nail is 2d which is 1 inch (2.5 cm) long. A 10d nail is 3 inches (7.6 cm) long, and a 16d nail is 3.5 inches (8.9 cm) long. Between 2d and 10d the nail length increases 0.25 inch (0.64 cm) for each penny designation. Beyond 10d there is no logical progression to the lengths and designations. Nails may have been used in Mesopotamia as early as 3500 B.C. and were probably made of copper or bronze. Later, iron was used to make nails. Early nails were shaped, or forged, with hammers. They were usually made one at a time, and were consequently scarce and expensive. By the 1500s a machine was developed which produced long, flattened strips of iron, called nail rods. These strips could then be cut into lengths, pointed, and headed. Nails were so valuable in the early American settlements that in 1646 the Virginia legislature had to pass a measure to prevent colonists from burning down their old houses to reclaim the nails when they moved. Two early nail-making machines were patented by Ezekial Reed of the United States in 1786 and Thomas Clifford of England in 1790. These machines cut tapered pieces from flat iron sheet, then flattened the head. In rural areas, black-smiths continued to make nails from wrought iron right into the 20th century. The first machine to make nails from metal wire was introduced in the United States in about 1850, and this technique is now used to make most of the nails today. Most of the 300 different types of nails produced in the United States today require no new design work. Once a nail has been designed, forming dies and processes are developed for its manufacture, and the nail is produced in quantity. Most nails have a broad, circular head. Finishing nails have a narrow, tapered head which allows them to be countersunk below the surface of the material and covered over to produce a smooth finish. Upholstery nails have decorative heads. Double-headed nails are used to fasten wood forms used in concrete pouring. The nail is driven in up to the first head, leaving the second head protruding. The protruding head allows the nails to be easily removed and the forms quickly dismantled once the concrete has hardened. The shank is usually designed to be round and smooth. Shanks with serrations, annular grooves, spiral flutes, or helical threads are used when a stronger, more permanent grip is required. Thermoplastic coatings may also be added to the shaft. These coatings heat up through friction while the nail is being driven, then quickly cool and set to lock the nail in place. The diameter of the shank is determined by the type of nail. Most nails, called common nails, have a relatively large diameter. Box nails, originally used to make thin-walled boxes, have a smaller diameter shank than common nails. Finishing nails have a very small diameter shank in order to make the smallest hole possible. The most typical nail point is a four-sided tapered cut called a diamond point. Other nails may have a blunter point to prevent splitting certain woods. Chisel points, barbed points, needle points, and many others are sometimes used on specialty nails. As new building materials become available, nail manufacturers work to develop new nails. There are special nails for tile roofing, hardwood flooring, shingles, rain gutters, wall board, sheet metal, and concrete. Some new nails are designed to be driven by air-powered nail guns rather than by a hammer. There have even been new nails designed for specific applications in the aerospace industry. This massive, mid-19th-centvry nail cutting machine used a shearing action to cut nails from bar iron. Nails are essential to the construction of wood-framed buildings. This, however, was not always the case. Until the late 18th century, Americans built wooden buildings using heavy timber frames. At places where these massive timbers had to hold together, one end of a post or beam would be cut down to form a tongue ("tenon") and fitted into a hole ("mortise") cut in the adjoining beam. Additional strength could be added by driving wooden pegs through auger holes in the joined timbers. The skill and labor involved in such construction was considerable; carpenters had to be highly skilled individuals and, as such, commanded high prices in colonial America. Until the end of the 18th century, nails were imported from England or made by local blacksmiths. The smithy, or often his apprentice, took a piece of bar iron maybe 5 feet long and 0.06-0.25 inch in diameter. Holding one end he heated the other, laid it on the anvil and, using the flat face of his hammer, tapered all four sides to about an inch from the end. He then used the peen, or sharpened end of his hammer, or a hardy, a wedge-shaped attachment to his anvil, to cut a notch in the rod. He thrust the sharpened end of the rod into a tapered hole in his anvil and snapped off the short nail. Then he flattened the end of the nail with four or five quick strikes of the hammer and popped it out of the anvil hole with a quick, upward strike at the point. 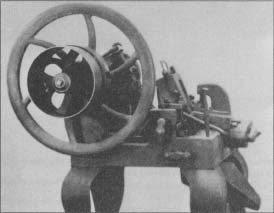 Between 1790 and 1830, several mechanical devices were developed in Europe and the United States to speed the production and lower the cost of nails. It is not entirely coincidental, therefore, that the balloon-framed house, which relied on two-by-fours held together by nails, was invented in the early 1830s in Chicago. The balloon-frame system required much less skill and labor in carpentry and made use of mass-produced nails. silver, monel, zinc, and iron are also used. Galvanized nails are coated with zinc to give them added corrosion resistance. Blued steel nails are subjected to a flame to give them a bluish oxide finish that provides a certain amount of corrosion resistance. So-called cement-coated nails are actually coated with a plastic resin to improve their grip. Some brads are given a colored enamel coating to blend in with the color of the material they are fastening. Most nails are made from coils of metal wire. The wire is fed into a nail-making machine which can produce up to 700 nails per minute. The nails may then be further twisted or formed, cleaned, finished, and packaged. 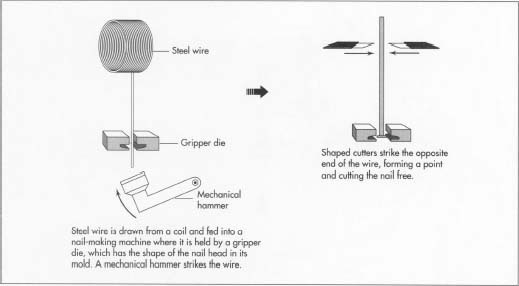 1 Wire is drawn from a coil and fed into the nail-making machine where it is gripped by a pair of gripper dies. The shape of the head of the nail has been machined into the end of the dies. 2 While the dies clamp the wire in place, the free end of the wire is struck by a mechanical hammer. This deforms the end of the wire into the die cavity to form the head of the nail. 3 With the wire still clamped in the dies, a set of shaped cutters strike the opposite end of the nail, forming the point and cutting the nail free from the rest of the wire coming off the coil. 4 The dies open and an expelling mechanism knocks the nail into a collection pan below the machine. The free end of the wire is drawn from the coil and fed into the machine. The cycle then begins again. 5 Nails with helical twists, serrations, or other surface configurations are fed into other machines that roll, twist, stamp, or cut the required forms. This may be a purely mechanical process or may require heating the material before forming. removes any oil from the forming machine and cleans up any small metal scraps, or nippings, that might be clinging to the nails. 7 Many nails are given a final bright finish before being packaged. 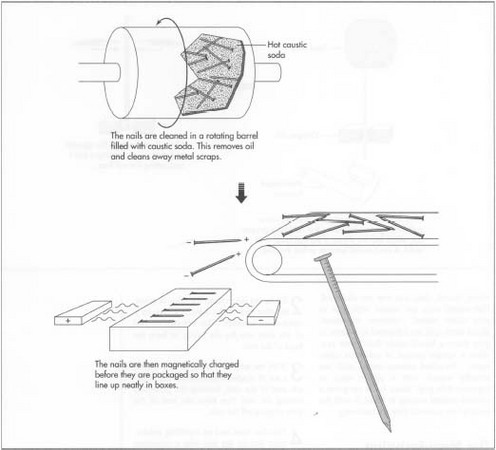 This is accomplished by placing the nails in a rotating drum of hot sawdust to lightly polish the surface of the nails. Other nails may be passed through an open flame in an oven to give them a blued finish. Galvanized nails are dipped into a tank of molten zinc in a process called hot-dip galvanizing. A zinc coating may also be applied by heating the nails to about 570°F (300°C) in a closed container filed with a powder composed of zinc dust and zinc oxide. Other coated nails are either dipped or sprayed to obtain their final finish. 8 Depending on the tolerances desired, some specialty nails may also require an additional heat treating step. 9 Magnetic elevators convey the finished nails to weighing machines which drop them into open cardboard boxes. As they are dropped in, a magnetic field aligns them so they stack in neat rows. After they are packaged, the nails are demagnetized. Nails are usually sold in boxes of 1, 5, 10, 25, and 50 pounds. Smaller nails, such as brads, are sold in 2-ounce or 4-ounce boxes and are packaged without being magnetically aligned. Raw materials must meet certain standards for chemical composition, yield strength, hardness, corrosion resistance and other properties. These are usually certified by the company supplying the wire, and may be independently checked by the nail manufacturer. During manufacture, nails must also meet certain specifications regarding dimensions and properties. These are achieved using a method known as statistical process control, which periodically samples the dimensions and properties of the nails being produced and evaluates any changes through statistical analysis techniques. The demand for mass-produced commodity nails is dependent on the fluctuations in the housing market, which varies with the economy. Demand for these nails is also subject to competition from foreign manufacturers, further reducing profits. The demand for specialty nails, on the other hand, is expected to continue to grow and be profitable. New building materials, such as composite wood-fiber and cement-based siding and roofing, require new specialty nails. New corrosion-resistant coatings for nails are also being developed. One unique new nail market is the result of the increase in building restoration and preservation efforts throughout the country. One nail factory in Massachusetts makes old-fashioned cut nails. They estimate that 20% of their work is in producing a variety of these nails for use in authentic building restoration projects. Loveday Jr., Amos J. The Rise and Decline of the American Cut Nail Industry. Greenwood Press, 1993. Vila, Bob. This Old House Guide to Building and Remodeling Materials. Warner Books, 1986. Johnson, Duane. "Nails Get a Better Grip." The Family Handyman, September 1994, p. 16. Whorf, Amy. "A Thumbnail History of Nails." Country Living, June 1993, p. 72. I need a high-resolution photo of a ringed nail, said to bedifficult to remove. ow to manufacture tiwisted nail(3" only)..